Dahlias are up and flourishing, and most of them are now past the major danger of annihilation by slugs and/or snails. However, those disgusting mollusks can still do significant damage to the foliage and even the blooms on our beautiful dahlias. We've had some interesting comments on our February slug-and-snail posts from blog-readers, but comments are often easy to overlook or to miss altogether if they came in after you'd read the blog entry. So we'll take a look now at some of those suggestions. An anonymous reader wrote, "I use egg shells. Crumble them and sprinkle them around your plants. They are good for the soil also. If you don't use enough eggs, ask your friends to save theirs for you." A coffee can, suggested Anonymous, makes a good receptacle to leave with your eggshell-saving friends "but don't forget to pick them up often." 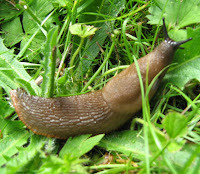 SAM71 asked if this method was really effective, noting that in the slugs in her Anchorage garden are "deadly." 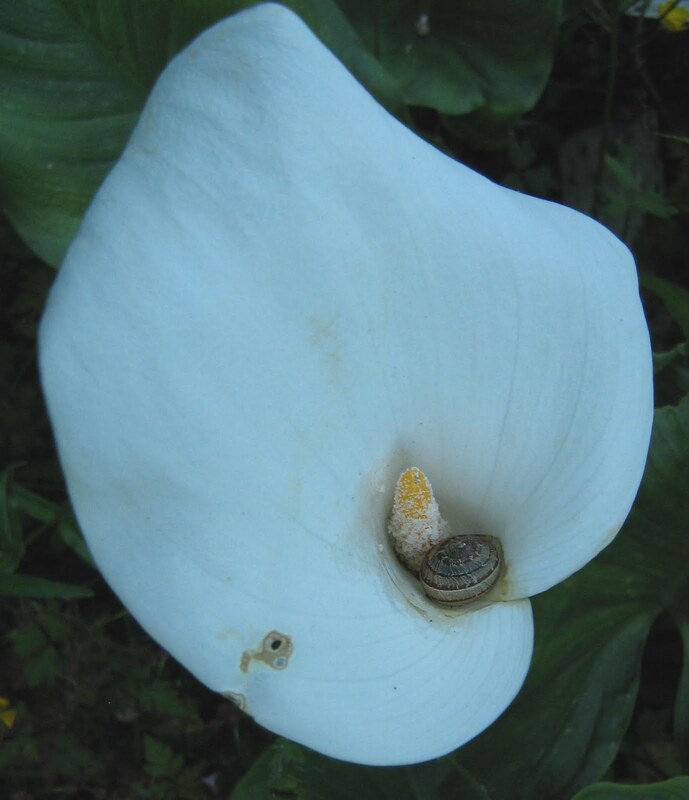 Elsewhere, I saw a comment from a gardener accusing her slugs of eating the eggshells. I tried the eggshell thing last week in my vegetable garden, putting coarsely crumbled shells around the new basil plants I'd set out. 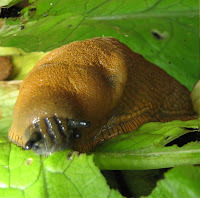 I was tempted to add some other slug-preventative (e.g. murderous substance) but I want to keep my veggie plot organic, so I decided to see how effective the eggshells were. So far, so good, although I think some of the teeny-tiny gray slugs found their way through; I should make sure there aren't any gaps. Next up on my the eggshell-application program are my precious dahlias. RFM added, "I have NEVER EVER had any luck with the beer method. My slugs are obviously non-drinkers. "I also go out with my flashlight and my plastic bag glove, and hand pick the little varmints," RFM continued. "Then I throw them into what my sons call "The Ring of Death" -- a circle of salt which means they will die, any way they sally forth. 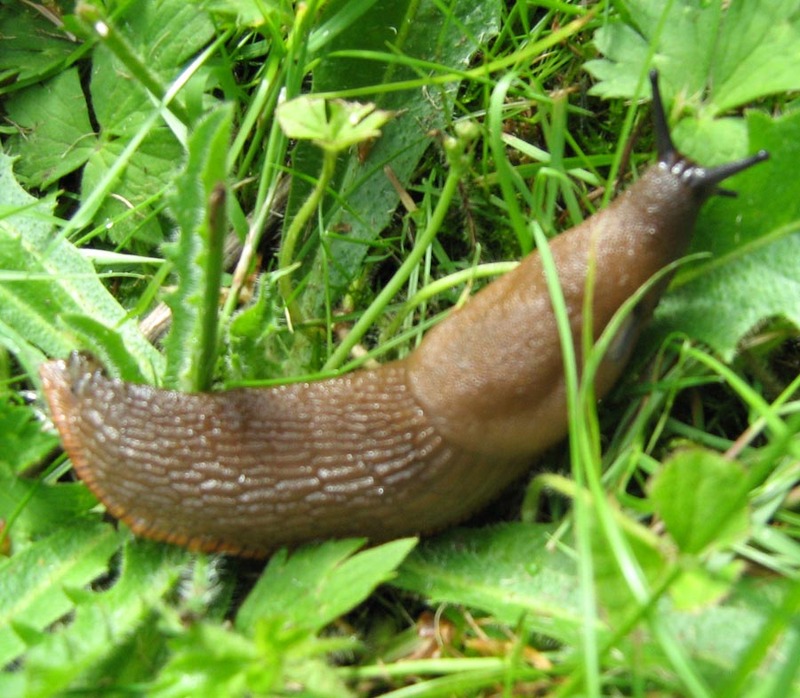 I am SO not into animal cruelty but I see no reason slugs should exist (same for ticks) so I put aside my morals in their case." Amen to that, fellow protector of dahlias! 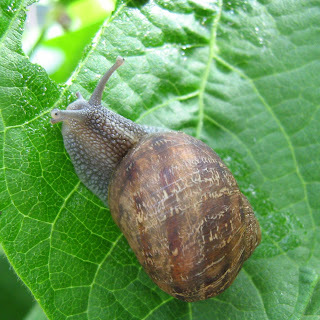 And the same goes for snails.